A Thai Buffet Feast for this Ramadhan! Let’s go a different cuisine this Ramadhan. My third sneak preview of where to Buka Puasa this Ramadhan landed at Chakri Palace where all three outlets under the Rotol Food-Chain Group are hosting a buffet of Thai cuisines and local Malay favorites. 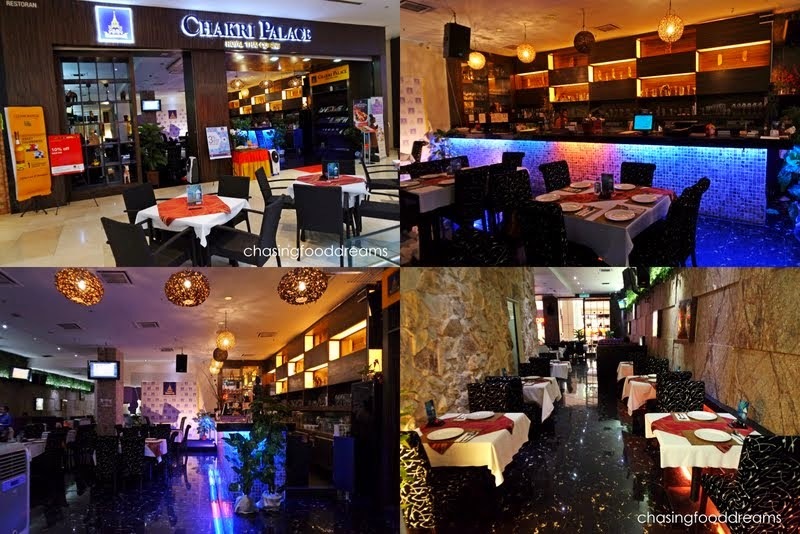 Chakri Palace has three different concept restaurants located at Pavilion KL, KLCC and Alamanda at Putrajaya respectively. 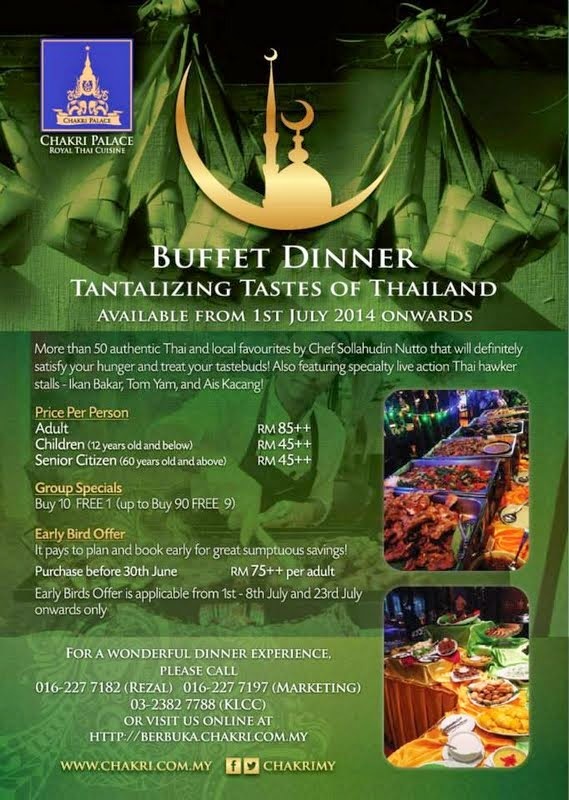 Feast on its spread of ‘Tantalizing Tastes of Thailand’ buffet promotion starting July 1, 2014 onwards. We visited the Chakri Palace at Pavilion Kuala Lumpur, opened in 2013, and have been serving up authentic Thai cuisine to many distinguished guests from all over the world. Chakri Palace prides itself on using the best and freshest ingredients with no added MSG. Helmed by head Chef Solahudin Nutto and the kitchen team, Chakri Palace is also renowned for their fruit carving masterpieces. The feast itself will evoke all the famous flavors of Thai – sweet, salty, sour and spicy. Menu is on daily rotation and diners can expect appetizers, kerabu salads, main courses, local Malay dishes, live action stalls, desserts and beverages. We started with my favorite Thai Iced Tea and Fresh Juices. These are not included in the buffet but are perfect thirst quenchers to kick off the meal after a long day of fasting. 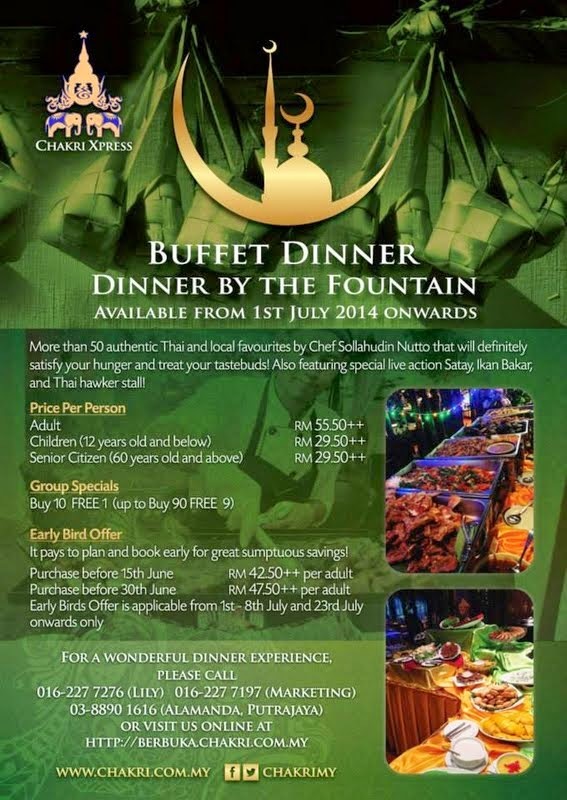 However, the buffet does include beverages like Sirap Mawar Selasih, Air Tebu and Teh Tarik. Mieng Kam, a classic Thai appetizer that packs quite a punch in flavors, is the perfect appetizer to whet the appetite. Daun Kaduk is folded into a cone to hold a lovely array of bits of ingredients like dried shrimp, chili, onion, ginger, lime, peanut, coconut and a syrupy tangy sauce. I don’t know about you but I love Mieng Kam and can devour these parcels happily. The crunch and flavors are addictive and delicious! Salads are not my favorite most of the time but Kerabus are! Feast on Som Tam or Kerabu Betik Muda, Kerabu Mangga Thai, Kerabu Glass Noodle, Kerabu Ayam Cincang and more at Chakri Palace. These are bursting with flavors and textures. I was particularly fond of the Som Tam with its garlicky sour and super spicy flavors. Gado-Gado fared decent with its creamy peanut sauce on vegetables and beancurd. Always present during the Ramadhan feast are Ulam-Ulaman Dengan Sambal Belachan with its array of raw and blanched vegetables served with potent pungent Sambal Belachan. Live action stalls are crowd favorites. Serving up hot food fresh off the heat are Satay Ayam and Daging, Ikan Bakar and Tom Yam Noodles. I had their Tom Yam in my previous visit. It’s quite potent in heat and sourness with a tinge of creaminess. Main course off the hot buffet has a combination of Thai dishes with local Malay dishes. We chowed down on Nasi Beriani with Rendang Daging Tok, Pajeri Nenas, Lamb in Thai Green Curry, Butter Prawn with Salted Egg, Stir Fried Mix Vegetables and Sautéed Beancurd with Minced Chicken. Winning more votes than others had to be the Lamb in Thai Green Curry. Tender lamb cooked in rich green curry bursting with a harmonious spice and herb mix had everyone piling their plates with lots of this dish. I went back for seconds. Rendang Daging Tok is very good too as Chef Nopporn gets his recipe from his mother-in-law. Soft beef pieces braised in loads of lemongrass, coconut milk and spices are beautiful. The list doesn’t end here but more dishes like Sautéed Squid with Garlic Sauce, Fried Sliced Fish with Tiga Rasa Sauce, Stir Fried Lala with Tom Yam Paste, Sliced Beef with Black Pepper, Sautéed Chicken with Basil & Chili, Fried Sliced Fish with Sweet & Sour Sauce, Crispy Mango Chicken, Steamed Fish with Lime & Chili Sauce, Stir Fried Kailan with Salted Fish and more are on daily rotation basis. Here’s something to end your day a little sweeter. Dessert list starts with Red Ruby Water chestnut, Pulut Mangga, Ubi Kayu Stim, Pisang Stim Manis, Bubur Jagung & Pisang, Bubur Kacang and ends with Fruits, local Malay Kuih and Aneka Jelly. 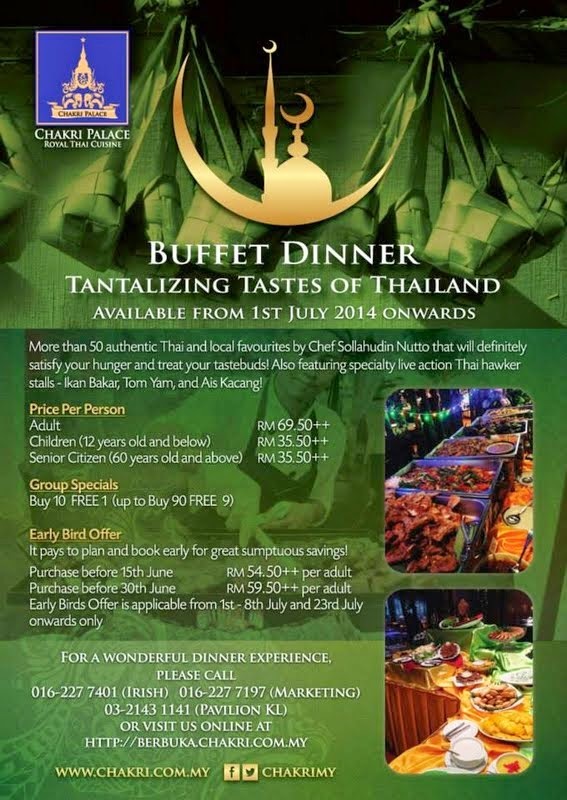 Go different, buka puasa this holy month and get a Tantalizing Taste of Thailand this July 2014! 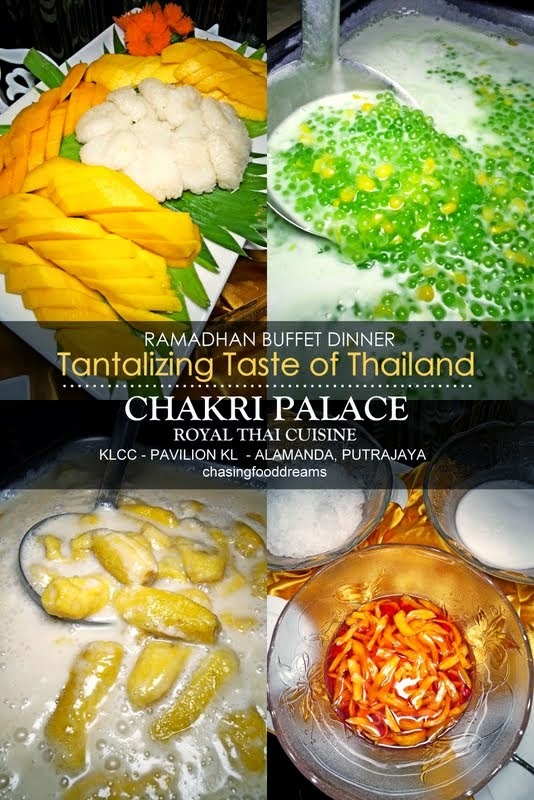 The Chakri Palace Pavilion KL and Chakri Xpress Alamanda Putrajaya Ramadhan buffet will be available daily from 1st July 2014 onwards. The buffet items are rotated from three different menus on daily basis and are open from 7.00pm onwards. CIMB cardholders will also enjoy a Buy 3 Free 1 dinner buffet. Lot C4.06.01, Level 4, Pavilion,168, Jalan Bukit Bintang, 55100 Kuala Lumpur. Mon – Wed : 11:00 am to 12pm. Thurs – Weekends : 11:00 am to 1am. Lot 417B, Level 4, Suria KLCC, 50088 Kuala Lumpur. Ooooo...mango pulut! My first and last love! Wait a minute! What's that? Prawns with salted egg? Ooooo...I love that too! Slurpsssss!!!! Drooling over my PC while reading this, can't resist Thai food!